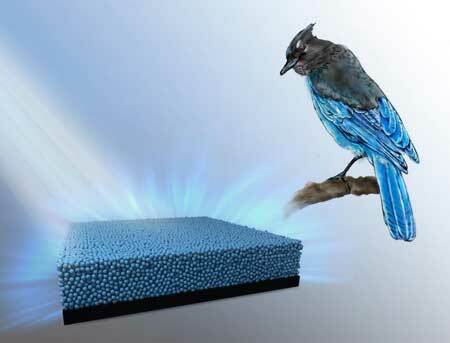 (Nanowerk News) A Nagoya University-led research team mimics the rich color of bird plumage and demonstrates new ways to control how light interacts with materials. Bright colors in the natural world often result from tiny structures in feathers or wings that change the way light behaves when it's reflected. So-called "structural color" is responsible for the vivid hues of birds and butterflies. Artificially harnessing this effect could allow us to engineer new materials for applications such as solar cells and chameleon-like adaptive camouflage. Inspired by the deep blue coloration of a native North American bird, Stellar's jay, a team at Nagoya University reproduced the color in their lab, giving rise to a new type of artificial pigment. This development was reported in Advanced Materials ("Bio-Inspired Bright Structurally Colored Colloidal Amorphous Array Enhanced by Controlling Thickness and Black Background"). "The Stellar's jay's feathers provide an excellent example of angle-independent structural color," says last author Yukikazu Takeoka, "This color is enhanced by dark materials, which in this case can be attributed to black melanin particles in the feathers." In most cases, structural colors appear to change when viewed from different perspectives. For example, imagine the way that the colors on the underside of a CD appear to shift when the disc is viewed from a different angle. The difference in Stellar's jay's blue is that the structures, which interfere with light, sit on top of black particles that can absorb a part of this light. This means that at all angles, however you look at it, the color of the Stellar's Jay does not change. The team used a "layer-by-layer" approach to build up films of fine particles that recreated the microscopic sponge-like texture and black backing particles of the bird's feathers. To mimic the feathers, the researchers covered microscopic black core particles with layers of even smaller transparent particles, to make raspberry-like particles. The size of the core and the thickness of the layers controlled the color and saturation of the resulting pigments. Importantly, the color of these particles did not change with viewing angle. "Our work represents a much more efficient way to design artificially produced angle-independent structural colors," Takeoka adds. "We still have much to learn from biological systems, but if we can understand and successfully apply these phenomena, a whole range of new metamaterials will be accessible for all kinds of advanced applications where interactions with light are important."